Inbound, the aircraft will be carrying Qantas CEO Alan Joyce and on the Tuesday he will be delivering an address to the Aviation Club at the Institute of Directors in London describing his experience. Qatar actually flies further, Doha – Auckland, in around 18hr with a Boeing 777-200LR, but the London – Australia nonstop flight has always been considered the ‘holy grail’ of airline operations. Back in the late 1930s, Qantas and Imperial Airways combined with a flying boat service that took nine days and covered 12,000mi. London – Sydney nonstop is some way off yet but Airbus has rolled out the first Ultra Long Range version of the A350 XWB (see in this issue), an aircraft that Qantas is known to be evaluating. Back in August 1989, the first Qantas Boeing 747-400, named City of Canberra, set a nonstop distance record for a commercial aircraft by flying 17,016km (9,188nm, 10,573mi) between the two cities in 20hr 9min – a one-off promotional exploit. This time, it is a Heathrow daily service leaving for Perth at 13:15 and arriving 13:00 the next day local time. If you can get your sleep pattern right, it is the perfect solution for travel to Oz. It is a three-class operation with 42 flat-bed seats in Business, 28 in an upgraded Premium Economy and 166 in Economy. As noted, flight time is around 16hr southbound and 17hr in the other direction. The flight is a complex operation involving four flight-deck crew and 10 cabin-service staff. It is only possible with the delivery of the fourth B787 of a planned eight. Since December, B787-9s have been used on Melbourne – Los Angeles, a mere 14hr, and Sydney – Dallas Fort Worth, a little over 15hr. The transPacific services have provided in some ways a training ground for the cabin staff, with identical aircraft and much the same in-flight service. From a practical point of view, the longer sector has been made possible by what is thought is the world’s first collaboration between an airline and a leading academic institution. The B787 should prove ideal, very well received with its lower cabin altitude and large cabin windows. This latest Boeing is made up of 50% carbon fibre and composite materials reducing weight, which allows for a 20% reduction in fuel consumption compared with similar sized aircraft. The University of Sydney’s Charles Perkins Centre has brought together researchers across a variety of fields from nutrition to physical activity, sleep and complex systems modelling. The project has included strategies to counteract jetlag, on-board exercise and movement, menu design and service timing, pre- and post-flight preparation, transit lounge wellness concepts and cabin environment including lighting and temperature. 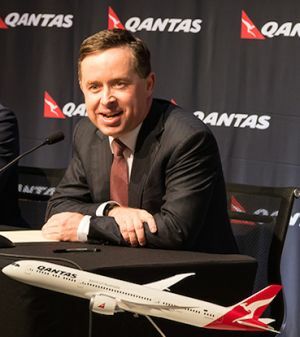 Qantas Group CEO Alan Joyce said the partnership has the potential to transform the journey for passengers, particularly on the long-haul routes that the Dreamliner is scheduled to operate. “While the Dreamliner aircraft itself is already a step change for passengers with its larger windows, increased cabin humidity and lower cabin altitude, the findings that will come from Charles Perkins Centre researchers will allow Qantas to design and develop a range of new innovations and strategies to complement the Dreamliner experience," he added. Professor Steve Simpson, academic director of the Charles Perkins Centre, said the partnership is hugely exciting as it is the first time there has been an integrated multi-disciplinary collaboration between an airline and a university around in-flight health and well-being beyond a medical emergency. “There is the potential for extraordinary health, science and engineering discoveries and innovations to come out of this research partnership, which will also provide the evidence-base needed for Qantas to implement strategies to further improve how people feel after a long-haul flight,” he said. Perth is a forward-looking young metropolis in a nation of young people and says it will soon overtake Brisbane as Australia’s third city. It sees the London flight as the opening up of a gateway to Australia and is heavily investing in its airport, the first stage due to be completed to coincide with the new Qantas service. All travellers in and out of the domestic airports west of Darwin and Adelaide will in the future transit Perth International for Heathrow and its European connections. Airlines such as Qatar and Singapore have quickly seen the opportunity and increased capacity through their hubs, typically with the A380. This give passengers a real choice. Fly nonstop London, or break your journey, stretch your legs, or change to one of the many alternative UK and European destinations on offer. It works the other way too. Whatever happens, it looks like Perth will be the winner.